Our vets diagnose a ruptured cruciate ligament by demonstrating an abnormal knee motion called a drawer sign, as well as quadriceps muscle wasting, knee pain and reduced ROM (range of movement). Often sedation is needed to get a good evaluation of the knee. This is especially true with larger dogs. 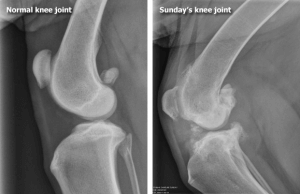 Since arthritis can set in relatively quickly after a cruciate ligament rupture, radiographs to assess arthritis are helpful. Another reason for radiographs is that occasionally when the cruciate ligament tears, a piece of bone where the ligament attaches to the tibia breaks off as well. Arthritis present prior to surgery limits the extent of the recovery after surgery though surgery is still needed to slow or even curtail further arthritis development. Several clinical patients are seen with ruptured cruciate ligaments. One is a young athletic dog playing roughly who takes a bad step and injures the knee. This is usually a sudden lameness in a young large-breed dog. At Eltham Veterinary Practice the most common breeds we see for ruptured cruciates are: Golden Retrievers, Rottweilers, Labrador Retrievers, Border Collies and Staffordshire Bull Terriers. On the other hand and more commonly, most dogs rupture their cruciates due to repeated low level injury, especially if overweight. Dog’s knees move in very much the same way as human knees, but if the top of the tibia (the tibial plateau) slopes backwards in the dog’s knee it puts stress on the cruciate ligament and can cause the ligament to rupture with repeated low grade stress. Humans have a perfectly level tibial plateau which explains why they are not prone to repeated low-level injury. 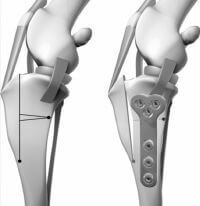 The TTO procedure OUTLINED BELOW corrects the angle of the tibial plateau to make it flat. Stepping down off the bed or a small jump can be all it takes to break the ligament. The lameness may be acute but have features of more chronic joint disease or the lameness may simply be a more gradual/chronic problem. Without an intact cruciate ligament, the knee is unstable. Wear between the bones and meniscal cartilage becomes abnormal and the joint begins to develop painful arthritis (degenerative joint disease). Bone spurs called osteophytes develop resulting in chronic pain and loss of joint motion. This process can be arrested or slowed by surgery but cannot be reversed. There are several different surgical repair techniques commonly used, but at Eltham Veterinary Practice we favour TTO for larger dogs and Lateral Suture for smaller dogs. 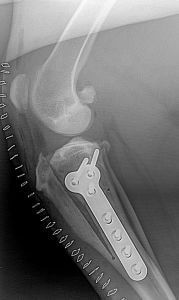 This procedure uses a fresh approach to the biomechanics of the knee joint and addressed the lack of success seen with the lateral suture technique long term in larger dogs. Performing a TTO for a dog corrects the angle of the tibial plateau to make it flat, more like a human’s. This eliminates the stress on the cruciate ligament. This is an extremely effective way of managing cruciate disease. With this surgery, the tibia is cut and a wedge is removed in such a way that the natural weight-bearing of the dog actually stabilizes the knee joint. As before, the knee joint still must be opened and damaged meniscus removed. The cruciate ligament remnants may or may not be removed depending on the degree of damage. This surgery is has been conducted at Eltham Veterinary Practice for over 5 years now. TTO is an intensive procedure requiring precision to treat the cranial cruciate ligament deficiency. We accept the referrals from other veterinarians across Victoria. Patients are sent home on two days after the surgery. Follow-ups are usually done either here or at the referring hospitals. Several radiographs (x-rays) are taken to calculate the angle of the osteotomy (the cut in the tibia). This procedure typically costs more than the extracapsular repair as it is more invasive to the joint. This surgery is currently favoured at Eltham Veterinary Practice in dogs up to 15kg in weight as it can be performed in a relatively shorter time than the other procedures and still gives a good outcome. The knee joint is opened and inspected. The torn or partly torn cruciate ligament is removed. Any bone spurs of significant size are bitten away with an instrument called a rongeur. If the meniscus is torn, the damaged portion is removed. A large, strong suture is passed around the fabella behind the knee and through a hole drilled in the front of the tibia. This tightens the joint to prevent the drawer motion, effectively taking over the job of the cruciate ligament. For the first 6 weeks you will need to keep your dog quiet with reduced activity. If your dog does too much exercise or vigorous play the success of the surgery could be jeopardised. You should keep your dog in a small enclosed area such as a laundry, bathroom or portable corral. These are good rooms for easy clean up of mess. Avoid stairs and slippery floors. You can only do very slow leash walking to the toilet, with no jumping, running or ball chasing. Rehabilitation after TTO needs to be gentle. Icing (as mentioned below) and rest are the main modes of therapy. After 3 to 4 weeks, an increase in light activity can be introduced. A water treadmill is helpful. Expect the osteotomy site to require a good 6 weeks to heal. Rehabilitation following the extracapsular repair method can begin as soon as the pet goes home. The area can be chilled with a padded ice pack for 10 minutes a couple times daily. (Do not try to make up for a skipped treatment by icing the area longer; prolonged cold exposure can cause injury.) Passive range of motion exercise where the knee is gently flexed and extended can also help. It is important not to induce pain when moving the limb. Let the patient guide you. Avoid twisting the leg. After the stitches or staples are out (or after the skin has healed in about 10 to 14 days), water treadmill exercise can be used if a facility is available. This requires strict observation and, if possible, the patient should wear a life jacket. 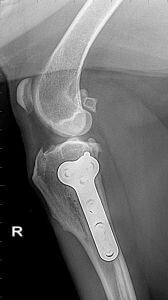 A dog with arthritis pain from an old cruciate rupture may still benefit from a TTA surgery. A knee replacement is now another option for severely arthritic knees at a surgical specialist. Most cases must make do with medical management. We mentioned the menisci as part of the knee joint. The bones of all joints are capped with cartilage so as to provide a slippery surface where the bones contact each other (if the bones contact each other without cartilage, they grind each other down). In addition to these cartilage caps, the stifle joint has two “blocks” of cartilage in-between the bones. These blocks are called the menisci and serve to distribute approximately 65% of the compressive load delivered to the knee. The only other joint with a meniscus is the jaw (tempero-mandibular joint). Pets with meniscal damage may have an audible clicking sound when they walk or when the knee is examined, but for a definitive diagnosis the menisci must actually be inspected during surgery. 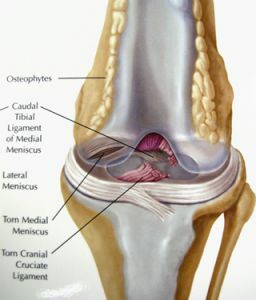 It is difficult to access the menisci and thus repairing a tear in the meniscus is problematic; furthermore, poor blood supply to the menisci also makes good healing less likely. For these reasons, removal of the damaged portion of the meniscus is the most common surgical choice.